Indie eco-horror entry Flora (2017) is set in the summer 1929, we have a group of five university botanists students who enter an unexplored forest somewhere in North America to study and document the native flora there, they having arranged to meet-up with their university professor who has already set-up camp deep in the wilderness. 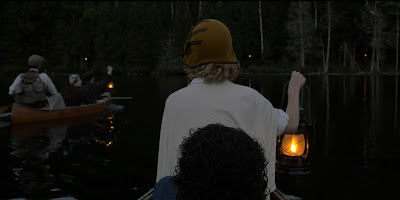 The travel by canoe to the remote location only to discover the camp is abandoned and the professor is nowhere to be found, and strangely all the food rations and supplies have been burned in a fire pit. After settling in to the unsettling situation they discover that nature itself has turned against them, without spoiling too much I will say that a deadly organism has been unleashed, and it wants them all dead. In the face of death of the five must use their wits and limited resources to find a way out; brainstorming, researching and occasionally arguing amongst themselves in the process. Our small cast includes lead botanist Basho (Dan Lin), illustrator Ora (Teresa Marie Doran), brothers Haviland (Caleb Noel) and Rudyard (Miles G. Jackson), nurse Avis (Sari Mercer)and navigator Charles (William Aaron), their various skills come in handy on this deadly excursion, but nothing can prepare them for what unexpected horror nature has wrought upon them. I give some serious props to first-time director Sasha Louis Vukovic for going with a period horror film set in the 20's right out of the gate, what he was able to do with what was surely severely limited resources is pretty exceptional, a lo-fi slice of science fiction that pays off in the end with a largely satisfying tale of eco-terror that lays on the suspense with an intriguing idea that sort of answers the question 'what if M. Night Shyamalan's The Happening (2008) was actually sort of good?'. Set deep in the Canadian wilderness the film is nicely shot with some gorgeous shots of pristine wilderness, aided by some cool-looking drone-assisted shots. I think that drones offer indie filmmakers shots they just weren't able to get a few years ago, but sometimes it's overused, drawing attention to itself, but this one not so much. The crisp "newness" of the digital cinematography sort of took me out of the story for the first few minutes until I got use to it, this is a film I think could have benefited from a 16mm film presentation, but that's easy for me to say from my vantage point as a reviewer, not a filmmaker. I have no idea how much more expensive that option might have been and what it entailed, but it's film and therefore probably lots more expensive. I'm sort of beating a dead-horse here but I like the retro-ish look of something like Ti West's The House of The Devil (2009) which was shot on 16mm film and has an older patina for it, for a period film I just think the visual aesthetic of the format would have added something. The cast here is good, they're not not all uniformly great, but they made for a cohesive group that felt authentic, though there's a bit of amateurish overacting is small doses throughout, and some language that seemed anachronistic, but overall I think they worked great together. Everyone was able to convey the desperation, paranoia and fear the story required, and I found it easy to forgive the stuff that didn't work so much. Each of the characters has a little bit of development, though I would say that the character of Ora is the most developed (and charismatic), we get some of her back story in regard to how it was difficult to be taken seriously as a female botanist (remember this was set in the 20's), and the nurse character (who wanted to be a doc) is also given the same sort of back story, I appreciated it all, I liked that it touches on the politics of the time without hammering it home. Alongside the good cast, the great locations and keen camerawork we have a rather good string score from composer Nathan Prillaman, it goes from atmospheric to rhythmically intense, and we have jazzy songs of the era, though for all I know these are were created by Prillman for the film, but they sound totally period specific, so if that's the case by hat if off yet again to you sir. Now, looking at the horror we have a film that might not be immediately satisfying to the visceral horror crowd, as the terror largely unseen it's represented by a certain something I won't divulge, but there's no masked slasher, there are no hideous creatures stalking the woods, in fact there are no creatures stirring in these woods whatsoever due to the nature of the horror, but I dug it quite a bit. Vukovic and the crew do a good job of laying on the atmosphere and suspense, but at nearly 100-minutes in length it has a nice build to it, but does have some long-in-the-tooth moments that could have used a judicious hand in the editing bay, but when you're making your first film it's probably hard to cut apart your baby. Separate from the film itself I would like to say the idea of distributor like Mill Creek Entertainment giving this a wide release is pretty cool, the label is most known for public domain, budget-minded TV shows and licensing some goodies from Sony among others, but taking a first-time director's film like this and making it available through all it's wide reaching resources, which includes Wal-Mart among other chain stores, it an interesting prospect. To think that you're film, small though it may be, would get that kind of distribution must be very appealing, I really hope they continue to take chances on indie filmmakers, this could be very interesting new facet to the label. 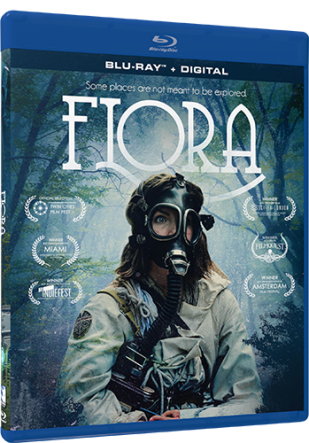 Audio/Video: Flora arrives on Blu-ray from Mill Creek Entertainment presented in 1080p HD framed in 2.00:1 widescreen, it's a lo-fi film but looks damn decent on Blu-ray all things considered, it has a nice warm palette and decent fine detail throughout, the darker scene also having some decent shadow detail. The only audio option on the disc is a well-balanced DTS-HD MA surround 5.1 option, it's well-balanced and clean, optional English subtitles are provided. Extras for the film include an audio commentary with the director and cast, a behind-the-scenes featurette, deleted scenes, trailers and a digital copy of the film for Mill Creek's proprietary streaming service. The single disc release comes housed in a standard Blu-ray keepcase (not an eco-case) with a one-sided sleeve of artwork, the disc featuring an image from the film. Flora (2017) is an engaging and engrossing slice of eco-horror, it's not perfectly executed but it's one of those movies that shoots for the moon and while it may not land on the lunar surface it's orbiting it for sure! If you're into the recent time-loop The Endless I think you might find this to your liking even though it's not the same at all, I say check it out. VINEGAR SYNDROME SEPTEMBER TITLES ANNOUNCED!